If you go out in the wintry dark before 8 AM you're bound to pass a butcher who is already busy cutting, chopping and handling huge chunks of meat. Or you’ll meet greengrocers pulling in boxes from Rungis market or you'll see fish sellers manoeuvring crushed ice to get their stands ready. 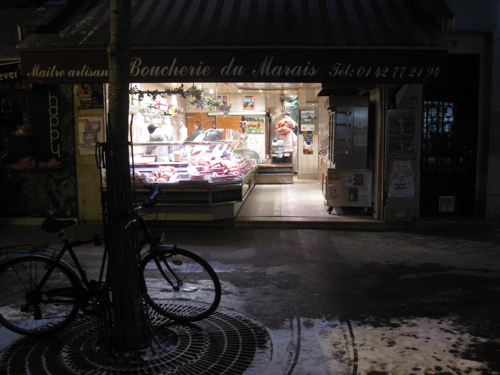 It’s hard work feeding the ever demanding Parisian customers, especially in wintertime. The open-shop concept of Paris adds a lot of charme to the street scene of the city and, of course, some Mediterranean feeling. But it kills the people who have to fill that pretty scene at sub-zero temperatures for the next 12 hours or so. The boss of my favourite butcher shop in Rue de Bretagne wears a thick blue bonnet covering his curly hair. They’re all dressed with three or four layers of fleece jumpers under their aprons but still they’ve been coughing and sneezing for weeks. You would imagine they'd be quite grumpy by now or lacking their natural politeness but it’s almost the opposite. Normally, they’re all smiles and even waving and shouting their eternal: “Bonjour!”. I imagine they feel like a band of brothers going through rough times together. 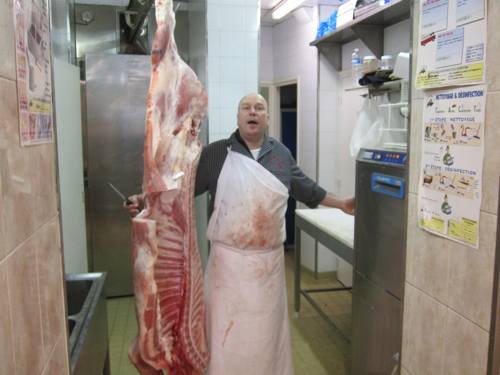 Not so long ago, I met my butcher as he was dismantling half a calf from the French Limousin. It was freezing cold and I wouldn’t have blamed him for being harsh and quick. But you know what? As I approached the scene, I heard him singing, some classic French chanson stuff. Really, he was standing there next to a huge piece of meat dangling from the ceiling and singing. And when he saw me and my camera, he started laughing and cracking jokes and finally, he said: "Elle est belle, la vie, non?” – Life is good, he said – and that, frankly, left a deep impression on me. They take pride in their everyday work, that is for sure, whether it be winter or spring. And at my favourite butcher they have every reason to do so. They work only with the highest quality beef, pork, lamb or poultry. They get their animals from farmers in the Limousin region or from Normandie, from Pauillac, Lozère or Bresse and they treat every piece with skill and a lot of respect. So you, as a customer and cook, deeply feel the obligation to follow suit. "Elle est belle, la vie, non?"